B.Tech in Data Science and Analytics is a new and highly demanded degree course. The ‘Data Scientists’ are required in every sector of the economy. Looking at its futuristic scope, people all over the world are opting for this course. 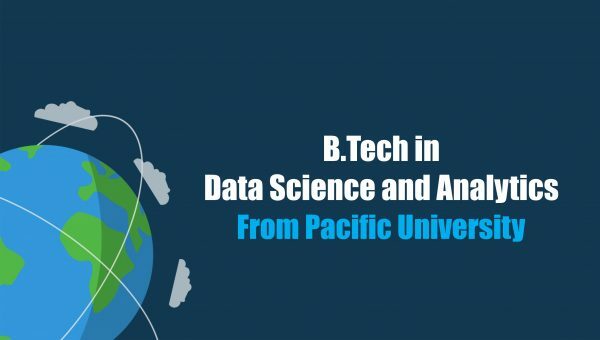 Pacific University is the only University in Rajasthan offering B.Tech in Data Science and Analytics. It is to be noted that by the year 2020, there will be almost 2.7 million jobs globally in the field of Data Science and Analytics. Further, it is also anticipated that India would become one of the top three markets for Big Data. This is going to create almost 7 Lacs job openings in India in the field of Data Science and Analytics. Graduates in B.Tech Data and Analytics are likely to have profiles of a Data Scientist, Enterprise Data Analyst, Data Analytics Specialist, Data Engineer, Business Analyst and a Machine Learning Engineer. The future prospects for successful students are immense and in all sectors of the economy worldwide. The chances and opportunities are innumerable and extensive. Pacific University is one of the leading universities in Rajasthan fulfilling the dreams of many students to have a bright career. The university has introduced a new course in the Bachelor of Technology- Data Science and Analytics. Pacific University has experienced faculty and trainers from industry. Focused intake is only 30 students per batch. Pacific University has industrial collaborations, emphasizing on practical knowledge.